Green, leafy spinach is one of the world’s healthiest vegetables, packed with beta-carotene, lutein, and zeaxanthin and high amounts of vitamin k, dietary fiber, manganese, folate, magnesium, iron, vitamin c, vitamin b-2, vitamin e, calcium, potassium, protein and vitamin b-6. spinach powder for the functional food and dietary supplement markets. 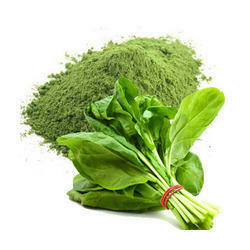 Being a customer oriented organization, we are highly engaged in providing a wide range of Spinach Powder. Food additives have been used for centuries to enhance the appearance and flavor of food and prolong shelf life. We are the trusted name in delivering quality Dehydrated Spinach Powder, these are easily available at affordable price. Our dehydrated palak Powder is prepared at our modern machining facility by using fresh palak under the observation of food inspectors and chefs. Being a noteworthy enterprise of this industry, we are offering a wide spectrum of Dehydrated Spinach Powder. Spinach is high in chlorophyll, vitamin K and minerals. It can be added to health drinks or used in cooking. Clients have found many wonderful uses for spinach powder. These include adding color and flavor to fresh/dried pasta, noodle and even soap manufacture. Use it in any dish that you want to add a bit of red to. A little goes a long way. We are leading supplier of this products . any qty we can supply.